Several knocks vie for attention in World Cup history, including some truly memorable centuries played in finals—Clive Lloyd in 1975, Vivian Richards in 1979, Aravinda de Silva in 1996, Ricky Ponting in 2003 and Adam Gilchrist in 2007. There is also Sachin Tendulkar’s magnificent 98 against Pakistan in 2003. 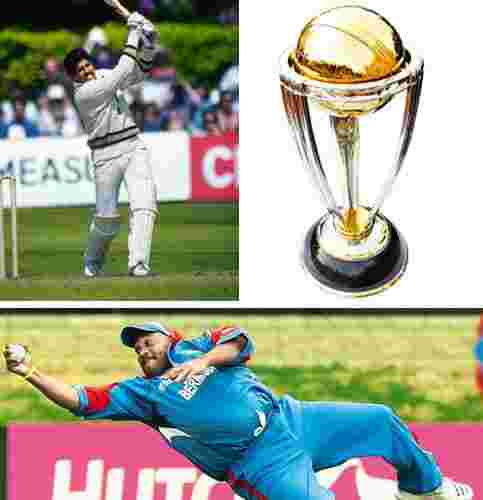 Exceptional efforts: (clockwise ) Captain Kapil Dev’s 175 against Zimbabwe in 1983 was perhaps the best World Cup innings ever played; the World Cup and Dwayne Leverock’s catch for Bermuda against India in 2007 remains a winner for its sheer unexpectedness. It was a crisis from which escape seemed impossible to everybody except the Indian captain. The hapless Zimbabwe bowlers had been hit all over the park as Dev went on a rampaging counter-attack, hitting 14 boundaries and six sixes. By the time 60 overs were completed, India had reached 266, Dev making 175 of these. The pitch had eased after the troubles of the early morning, but by then Zimbabwe had had the fight taken out of them. As is only too well known, that innings changed the fortunes of Dev’s team and India went on to win the World Cup. Cricket is touted as a batsman’s game. Runs and centuries remain longer in public memory than memorable spells. But no match can be won without the bowlers doing their job well. One spell I mulled over deep was the five-wicket haul by West Indies’ Joel Garner in the 1979 final. At one stage, England were 183 for 2; in a trice, as it were, they were bowled out for 194, the “Big Bird" cleaning up the middle order and tail. Garner was to show that day why he was the meanest One Day bowler of his time. Australia’s Shane Warne was hugely impressive too against the West Indies in the 1996 semi-final at Mohali. At one stage, the West Indies were 173 for 3, needing a modest 208 to win. But Warne was brought back by Mark Taylor and bamboozled the middle and lower order to bowl the West Indies out for 202. My vote, however, goes to Pakistan’s Wasim Akram. In the 1992 final against England at the Melbourne Cricket Ground, he got the ageing but still dangerous Ian Botham for a blob, then came back in the middle of the innings to remove the well-settled Allan Lamb for 62 and Chris Lewis for a first-ball duck. The stuffing had been knocked out of England’s challenge. There is no competition for Courtney Walsh’s magnanimity in not doing a “Mankad" on Salim Jaffer during the match against Pakistan at Lahore in 1987. The West Indies had to win to stay in contention for a place in the semi-finals. The match was a humdinger. When the final over started, Pakistan needed 14 runs to win. Walsh, who had bowled economically and picked up four wickets till then, was entrusted with the task of winning the match. With a mix of luck and bravado, Abdul Qadir somehow whittled down the target to two runs off the last delivery. As Walsh ran in to bowl, he saw Jaffar backing up way too much, but instead of running him out, the bowler warned him to regain his crease. In competitive sport, however, one good turn does not necessarily deserve another. Off the last delivery, Qadir hit the winning runs, and the West Indies were beaten by a whisker. Skipper Vivian Richards’ grimace when the match ended showed he was not too impressed by his fast bowler. But for upholding the best traditions of sportsmanship, Walsh received a handsome round of applause from the packed stadium, a Pakistani carpet from then president Zia-ul-Haq subsequently—and immortality. Limited overs cricket showcases brilliant fielding. Who can forget the bionic Jonty Rhodes’ run-out of Inzamam-ul-Haq in Brisbane during the 1992 World Cup? Kapil Dev’s catch to dismiss Vivian Richards for 33 in the 1983 final is, of course, etched in the mind of every Indian. Richards was batting with his usual panache when he mistimed a pull off Madan Lal. The ball looked like it would fall in no man’s land, but Dev, running 20 yards behind without taking his eyes off the skier, pulled off an amazing catch that was to turn the match around. There is no way I can omit either of these two attempts, but I find it impossible to ignore the slip catch taken by Bermuda’s Dwayne Leverock in Trinidad to dismiss Robin Uthappa in 2007 either. Leverock was an unlikely candidate to stand in that position, leave aside dive. Weighing in at 280 pounds (127kg), he looked more a Sumo wrestler than a cricketer. But he showed astonishing reflexes and intrepidity in diving full-length to his right to catch Uthappa, though it all seemed to happen almost in slow motion. Kolkata’s passion for cricket is part of the game’s lore. In 1976, more than 60,000 people turned up on the final day of a Test against England though India were at the losing end! In the 1987 World Cup final, a packed house cheered both England and Australia as they played the World Cup final. Why such a sports-loving spectatorship should have turned so ugly as to get the semi-final between India and Sri Lanka in 1996 called off is a question oft-asked even today. True, India were almost out of the game and disappointment was acute. After the first over of the match, it had appeared this would be a cakewalk for Mohammed Azharuddin’s team. Javagal Srinath’s two early wickets had put Sri Lanka in a deep crisis. But they found a saviour in Aravinda de Silva, who played a masterly knock to take his team to a defendable total on a rapidly deteriorating pitch. With Sachin Tendulkar’s dismissal, India’s challenge seemed to fizzle out as wickets started tumbling. The restive, angry crowd, not taking too kindly to this poor performance, started hurling debris on to the field. With the police unable to stem the riot, play was called off and Sri Lanka awarded victory. Vinod Kambli walking off the ground in tears remains a vivid image of India’s defeat—and the mayhem in cricket’s paradise.